Penny Boards are a kind of Shorter longboards referred as short cruisers made of plastic or maple for the best experience, these skateboards was found in 2010 by Ben Mackay and this is based in Australia. Maple is high in cost whereas plastic penny boards are affordable. Today we will check for the top 10 best penny style boards to make your skating fun and powerful, also the important factors you need to look while choosing the best penny boards as per your style. To make our readers work easier, we have researched for the top 10 best penny boards from different manufacturers, who are well known for their performance, quality, price and much more. Quality is also one of the important factor to look while choosing the penny style boards, to know how to pick the right penny board for your style you can check out the buying guide at the end of the article. There is no wonder in the manufacturer Penny ranking first in our best picks of penny style boards and the manufacturer includes all necessary feature a penny board should contain. 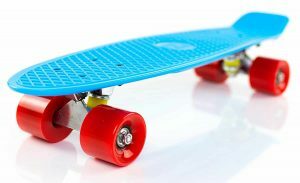 The manufacturer has produced the penny skateboard in different attractive colors so that you can choose the preferred one as per your choice, some includes mixture of red, white & Cyan, black, black gold metallic, Blue Jay, Buffy, Burgundy,canary, gamma glow, mixture of black, pink and purple and much more. The penny skateboards are made of good quality plastic and therefore they last for a long period of time, they have soft wheels with ABEC 7 bearings so that you need not worry about any skipping even in the skippy areas. No assembly is required, you can start riding once they are delivered. The price of the product is expensive but worth the money invested on the penny nickel skateboards, measures about 5.51 pounds in weight and comes with the dimension of 27 x 6.9 x 4.8 inches. The second product in our best picks of penny boards is for the reliable manufacturer of producing good quality products for their customers at a reasonable rate. The manufacturer has indulged multiple factors that make them show unique among other skateboards. The manufacturer has delivered the penny style boards in multiple colors namely white panda, black mamba, black rainbow, black tiger, blue ocean, green chameleon, midnight mist, mint bliss, orange disco and much more. When considering the performance, the penny board contains Abec 7 Skate bearings, aluminium trucks which are 3 inches, urethane skatro wheels which are 59MM. The skatro flex technology assures the optimal flex on each of the skateboards. The manufacturer tops the product with their amazing value, they get operated in a fraction of second, it comes with a T-tool standard and this has more value when considered to the other types. The two attractive highlights that makes the product a better one is their skatro flex technology and the ultimate Abec 7 bearings. 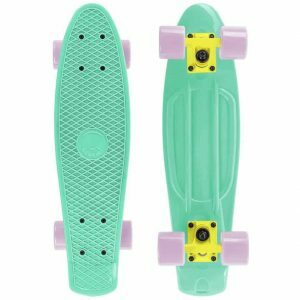 The price of the product is high but worth the money invested in the penny board, measures about 5.07 pound sin weight and comes with the dimension of 9 x 2.5 x 5.1 inches. The third product in our best picks of skateboard penny board is for the effective manufacturer Ridge Skateboards who has developed thousands of products for their customers at a reasonable rate, available in plenty of colors in the combination of black with blue, clear, clear green, pink, purple, white, red, yellow, green, blue and much more. When compared to the ridge board, this product is reliably high in dimension, they come with PU wheels which is of 59mm 78A and makes it stable on any non skipping path, the deck come with larger dimension of larger turning circles, the wheels are same as the original ridge skateboards. The ridge brand is developed with good quality plastic and therefore ensures the durability of the product, they have a great design which attracts the customers to pick them without any hesitation. 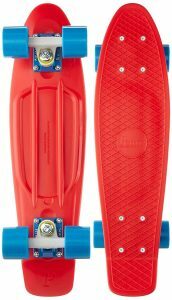 The price of the product is high but worth the money put for the penny skateboards, measures about 5.51 pounds in weight and comes with the dimension of 26.8 x 7.5 x 3.9 inches. The manufacturer offers warranty for the product so that you need not hesitate to get them in any situation. Do you need to experience a powerful riding with confidence? If so choose the boss board skateboard without any confusion as they include all necessary features that a penny style board should contain and this ranks fourth in our best picks of penny style boards. Available in most attractive colors namely combination of red wheels and blue deck, Dragon, which is the combination of yellow wheels and red deck, Easter Bunny, which is the combination of pink wheels and white deck, Revolution, which is the mixture of red wheels and black deck and stealth which is the combination of white deck and black wheels. The street board is a compact one and can be stored anywhere you need, does not require more space for the storage as a whole they are the complete and immediate skating penny board for the users. No assembly required so that you can make use of them immediately once you receive the product. The vintage color combinations is the important highlight of the product, the deck comes in a color and wheels in another color, the top construction is made of plastic deck and comes with super wheels for making your ride smoother. The skateboard comes with solid aluminium trucks, the manufacturer offers lifetime warranty and therefore you can get the product without any hesitation. The price of the product is high but worth the money invested on the product, measures about 3.7 pounds in weight and comes with the dimension of 6 x 5 x 22 inches. The fifth product in our best picks of penny style boards is for the reliable manufacturer Cal 7 who have developed successful products for their customers at a reliable rate. The manufacturer has developed the penny skateboards in attractive colors namely combination of black/yellow and red/green, blue/white/red, donut, yellow/icy green/light pink,jelly bean, joker, lily, lotus and much more. The penny style boards does not require any assembly and therefore you can use them once you receive the product, the specifications of the penny style board that make them high is their 59mm soft wheels which provides the powerful riding experience, Abec 7 bearings and truck that is made of aluminium this comes with 3.125 inches. The premium materials used to develop this penny style boards ensures you for the smooth ride and increased speeds, as a whole the skateboard provides the excellent performance to the users. The manufacturer offers lifetime warranty and therefore you can get the product without any hesitation, best for both beginning and advanced skaters. The price of the product is reasonable, measures about 4 pounds in weight and comes with the dimension of 7.5 x 31 inches. 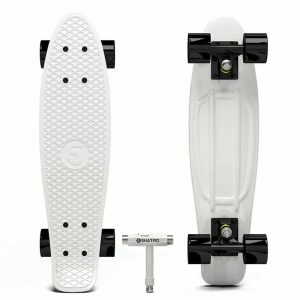 Are you looking for an extra powerful penny style boards for both beginner and advanced skaters, if so choosing this karnage penny skateboard would be the right pick and this ranks sixth in our best picks of penny skateboards. The manufacturer has developed in various designs, colors and patterns namely with the combination of Chrome red/yellow, Blue/red, purple/green, chrome red/yellow. The manufacturer has developed the penny style boards in premium quality plastic with cut out handle design and therefore carrying them to anyplace in made easier, this also ensures the durability of the penny style boards. The deck measures about 23 X 6 X 5 inches and they also comes with trucks that are made of good quality allow and are 3 inches in size. The advanced specification of the skateboards includes ABEC 7 bearings, branded wheels for the non slip and superior performance. The manufacturer has finished the penny style boards in attractive tricolor chrome pains, chrome, matter etc for the alluring look. The price is reasonable and falls within your budget, the manufacturer offers warranty and therefore you can get the product without any hesitation., measures about 4.1 pounds in weight. Are you looking for a penny board filled with graphics and light? If so, go with the dreamfair cruiser without any confusions as they have been developed with graphical scriptures and also good quality materials for the extraordinary performance and this ranks seventh in our best picks of penny board styles. The truck and deck measures about 22 inches and the material that are moulded injected with plastic makes the skateboard sturdy and strong so that it does not break easily, the alloy truck made of aluminium, which is 3.125 inches size. The PU wheels is made of elastic materials and therefore provides the maximum comfort and durability while skating, the skating board can handle up to 200 pounds for the reliable performance. The skateboard is completely assembled and therefore can be used once you receive the product, the penny boards are opt for children, beginners and for the people who loved to make a collection of various skateboard styles and designs. The manufacturer offers lifetime warranty for the product and therefore you can get the product without any confusion, the price is affordable and falls within your budget so that you can get the product without any hesitation. Measures about 3.86 pound sin weight and comes with dimension of 22 x 6.1 x 3.8 inches. 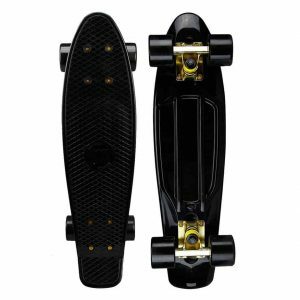 Are you looking for a penny style skateboard in an attractive black ? If so, get this mayhem product without any hesitation as they are developed with exemplary black along with powerful feature for making the product unique among other skateboards, this ranks eighth in our best picks of penny style boards. The manufacturer has developed the skateboard in premium quality plastic material and therefore ensues for the longevity, the highlighting specification of the penny style includes high speed bearings made of stainless steel and ABEC 7. The penny style board does not requires assembly and therefore you can start skating once you receive the product, the skateboard is perfect for hill bombing as well as cruising. The 59mm soft wheels makes your ride smoother and they does not skip even in any skidding areas. The price is affordable, the manufacturer offers warranty for the skateboards so that you can get them without any hesitation, measures about 3 pounds in weight and comes with the dimension of 22 x 6 x 4 inches. Are you in need of multiple colored designs and pattern skateboards? 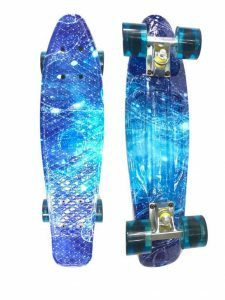 If so, Rimable would be the right choice as they has developed them in attractive colors, designs and patterns to attract the customers and this ranks ninth in our best picks of penny style skateboards. 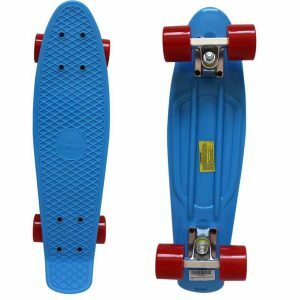 The manufacturer has offered the skateboard in multiple colors namely in the combination of Blue/red, black/blue, black/pink, black/red, blue/red, color circle, galaxy, grafty, green/black, joker,ocean world and much more. The skateboard is made of high quality plastic materials and therefore you are ensured for the durability, they comes fully assembled and therefore you can use the product once you receive. The highlighting specification of penny style boards includes ABEC 7 bearings, 59 MM Soft wheels etc. The PU wheels comes with high speed bearing and this makes your ride smoother as well as powerful, the maximum weight capacity the penny style board bear is up to 90 kgs. The truck is made of aluminium and are 3 inches in size. The manufacturer offers warranty for the product so that you can get the product without any hesitation, measures about 4 pounds in weight and comes with the dimension of 21.6 x 5.9 x 3.5 inches. The price of the product is low and falls within your budget. Last but not the least, the final product in our best picks of penny style boards is for the reliable manufacturer of producing high performing skateboards, Penny Skateboards who has delivered tons of successful products for their customers at an affordable rate. 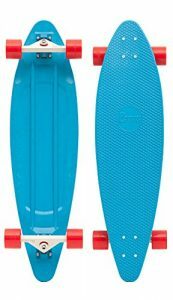 The penny style boards comes in different colors and patterns namely cyan blue, glow, rasta and royal blue. The penny style longboards are made of good quality plastic with concave and camber for the longevity. The textured grip materials makes the product more strong, also comes with classic waffle top, reverse kingpin trucks, ABEC 7 bearings, soft wheels etc. The manufacturer has designed them with added flex control and other powerful components. The price of the product is affordable, measures about 8.5 pounds in weight. The manufacturer offers warranty and therefore people can choose this skateboard without any hesitation. Once you have chosen the right products from the above manufacturer, you should know whether the following factors are present so that you will have the fulfilment that you have purchased the right one. 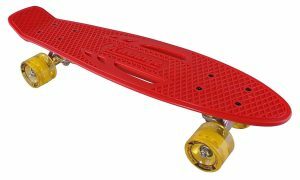 Are Penny Boards Hard to ride? Penny boards are derived to be in plastics and many say that this is the backslash in the skateboard community, when compared to the regular skateboards, penny boards are slightly expensive. Penny boards as well as mini cruisers are difficult to drive, the designs of the penny boards has been evolved from the custom drawn art, animal print and also there are LED light that light up penny boards. Each penny board come with wheels, trucks and plastic deck, the wheel size range from 22 inches and differ in the diameter of 59mm, they also come in the scale of 83A as the typical hardness. The top of the deck contain waffle and therefore there would be no chance for slipping even on the non slip surface. Proceed below to check for some of the important factors to look in a penny boards. Most of the penny boards are designed to be short when compared to the standard longboards, the penny boards are made of premium quality plastic for the durability and therefore easy to carry them wherever you move. The pennyboards does not requires much space when compared to the ordinary skateboards, the plastic is made with equal mix of stiffness, strength and flex, this will provide a greater riding experience. Another important thing to consider is their ride experience, they are mostly injection modules and are designed to produce good riding experience. The penny board contains aerodynamic form that is not available in any other materials and therefore they are fast and light in weight. 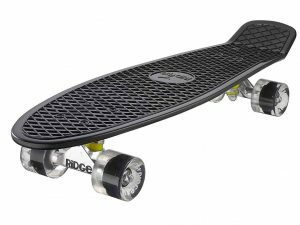 Hope the above buying guide and best picks of penny boards has provided you the clear idea on the topic. Any ideas, suggestions, and queries on the penny style boards are welcome. Have you used any of the above penny boards before? If so, share your experience through the comment section below. I am using Karnage cut out handle Penny Style Board. It just rides fast and it is very safe to handle. I am very happy using this. Can you give some reviews about using it with my sister who is only 8 years old? I am looking for the best penny board to gift my brother. In that way, I had come across your article. Its really fantastic and is very helpful for me to pick up the standard one. Thank you, Jonathon, for this great article.